I’ve been in Philadelphia now a week now, covering ETA’s role in the 2016 Democratic National Convention. I’ve met amazing staff, and so many people from all walks of life, working to ensure that delegates travel safely and timely between convention sites. It has been challenging. Weather, protests, security protocols—out of scope of ETA. But these are normal things that can occur in large venue management. As I traveled around the various ETA sites, I couldn’t help but notice two hard workers—Tom Woodson and Avi Winglovitz. They encapsulate the wide range of our support staff, Tom because he is the most senior member of ETA’s support team, as a Boomer, and Avi, because she is the most junior at 17 years old, a member of Generation Z.
I was interested in knowing more about both. Here’s what I found out about both. • She loves details and organization. • She feels at home managing events and has planned events for her Student Council since sophomore year, including her school’s prom, homecoming, and winter formal. • She likes thinking outside the box and fixing things on the fly—and she has figured out she is pretty good at this. • She has picked up budgeting skills and communicates well with others. Basically, she knows that she loves event management, and, through a connection, is “trying on” transportation event management at ETA. At the 2016 DNC, she is managing ETA’s volunteers, which number more than 200. 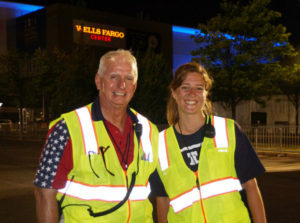 Tom, on the other hand, is working in the bus lot at Wells Fargo Center, responsible for coordinating bus maintenance and assisting overnight marshalling yard operations. From Orlando, Tom has a pretty impressive resume: He’s worked a dozen Super Bowls plus an Olympics event and has been involved with event transportation management at National Hockey League play off games, as well as Major League Baseball All-Star Games. For the 2016 DNC, he has his own ETA-issued golf cart, and traverses ETA’s bus staging area, carrying key ETA personnel to designated drop-off points. His main job is to ensure that the buses receive a nightly maintenance check and that they’re fueled and ready to go for the next day’s transit operations. Both Tom and Avi have gone the extra mile to make sure that the 2016 DNC transportation unfolds in a positive way for delegates and media. In event transportation management, it’s good to know who’s on your support team and what motivates them. These are your front line folks, and they represent the face of your company to guests. Make sure you spend time with them, and that they understand their role in the event. Thanks for a great job, Tom and Avi!